We are very excited to announce the first ever Krawdaddy Bicycle Show and Swap Meet. This event is going to be put on by some nice folks in Spanish Fork. I ran into David Davis the other day at one of the bike shops in the valley. He was hanging up really cool looking fliers so we struck up a conversation. It turns out he is one of the organizers of this awesome event and wants to make it a regular occurrence. He said there are some fully restored older bicycles as well as some not so restored bikes. He also extended an invitation to everyone who wants to to bring their old bikes and parts. 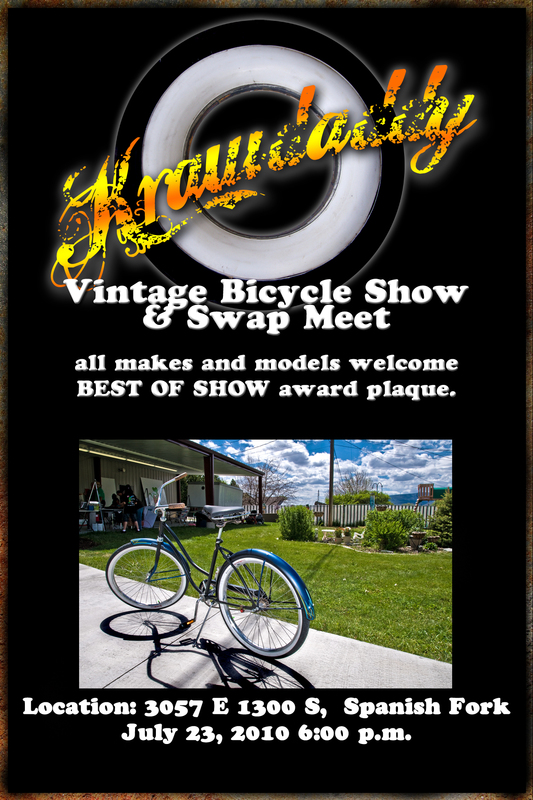 You can sell them or enter your really awesome bikes in the Best of Show competition. I know a few other people who know about this event and they are are very excited to organize bicycle rides out to Spanish Fork. As rides emerge we will keep you updated. So, start polishing up that old cruiser and get ready to have a lot of bicycle fun. Here is all the important info.